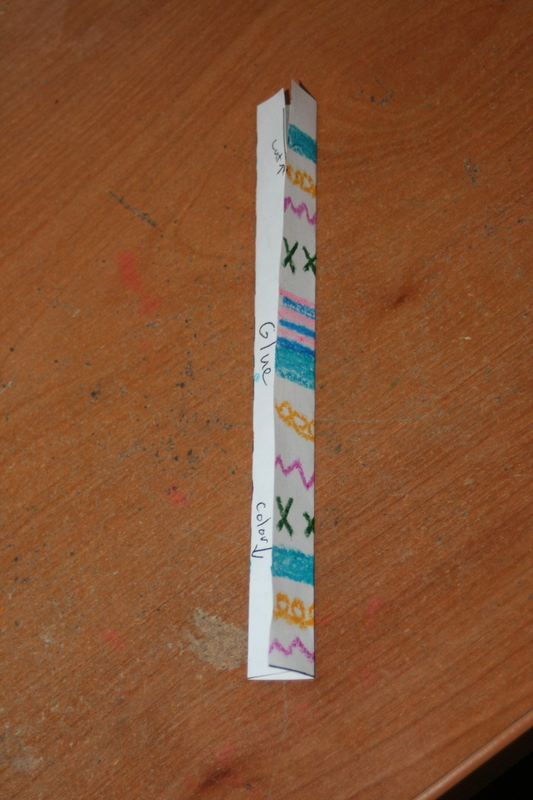 Day 3 we made Prayer Windsocks. 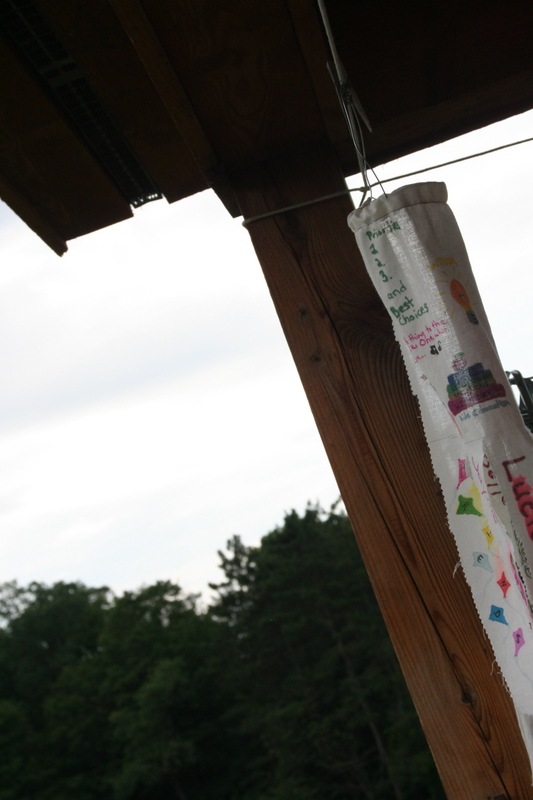 While searching for my crafts online, I ran across Artist Holiday and LOVED the concept of prayer flags that she used at her church’s SKY VBS this year. 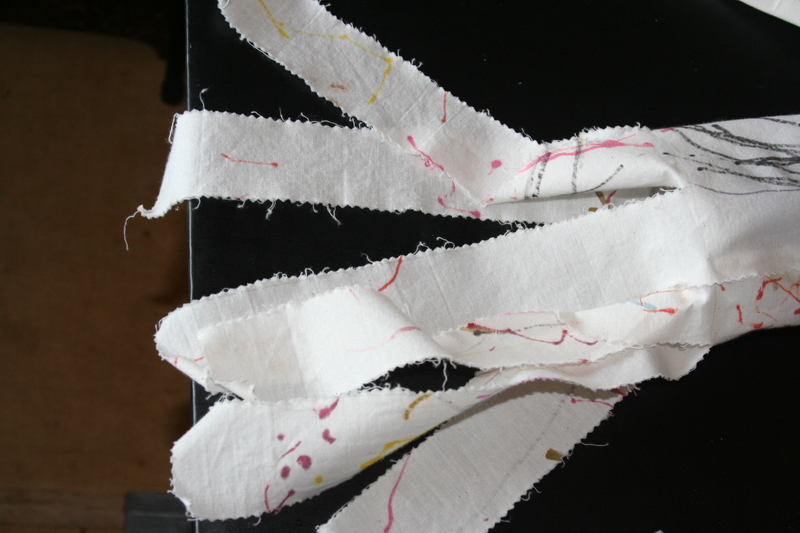 See her post about them here, where she gives a more detailed understanding of prayer flags. 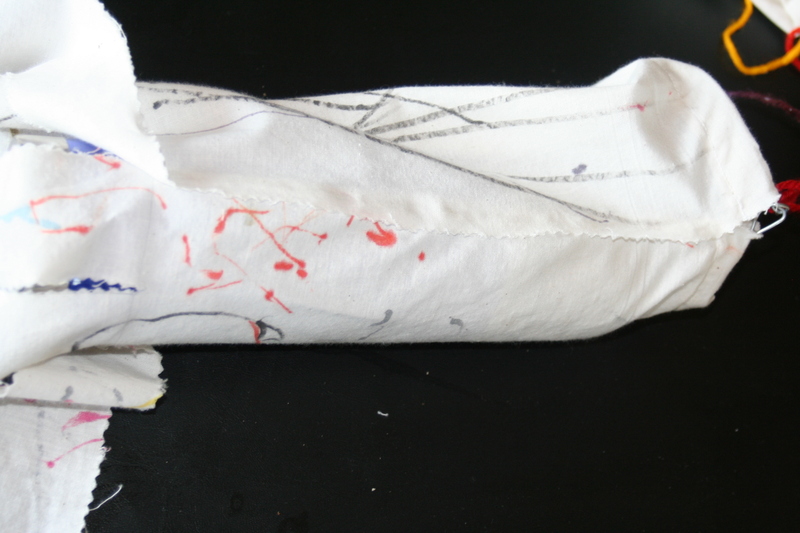 Inspired by her shared information and wanting to give our VBS kids the same opportunity to explore prayer with pen and fabric, I developed a similar project. 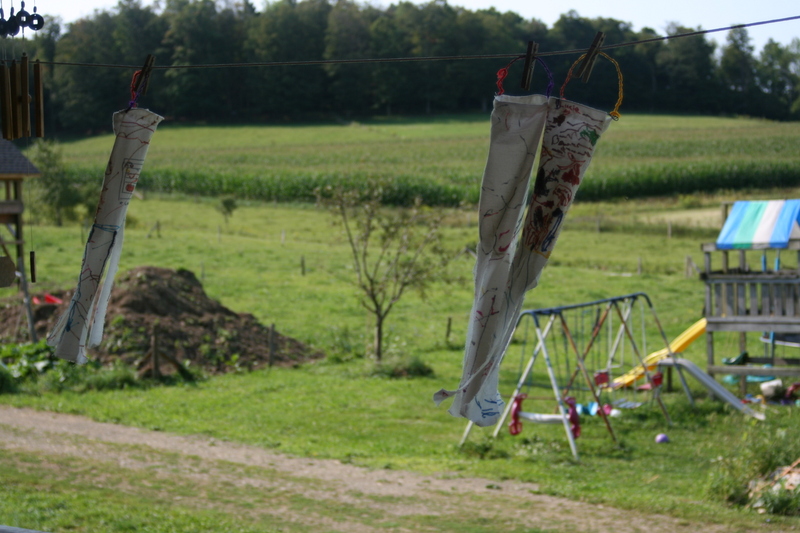 These windsocks were hopefully brought home and hung up to be a pretty reminder of God’s presence as one who loves to hear our prayers. 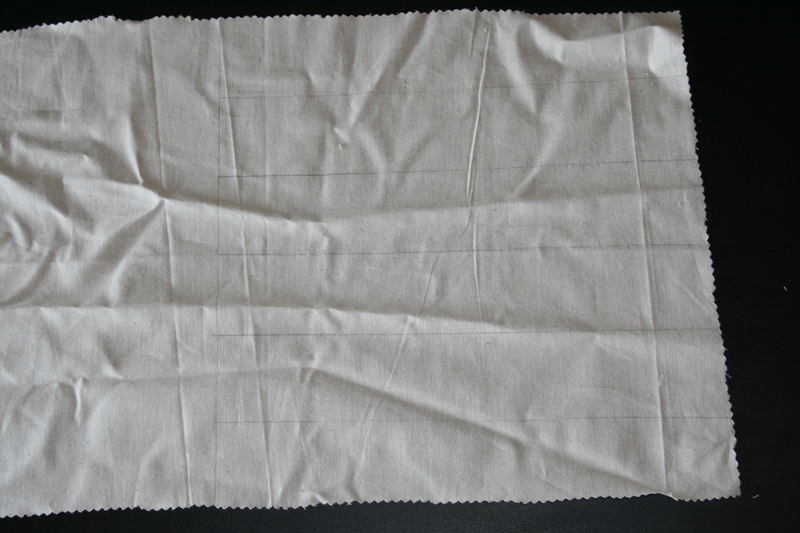 I cut the rectangle with pinking shears to limit fraying. 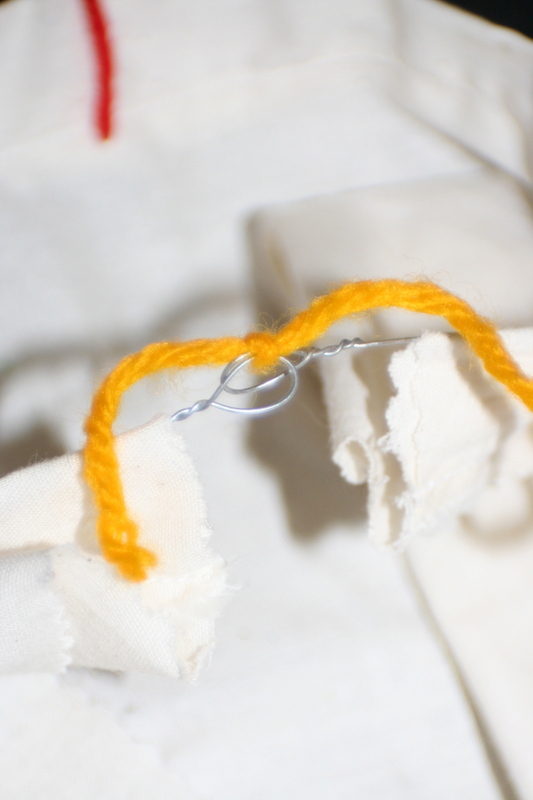 Fold over and stitch a channel in one end. 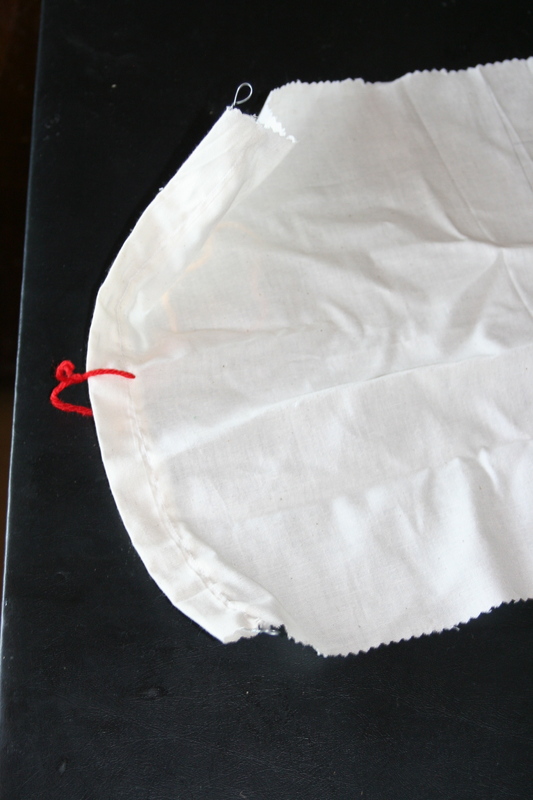 (For a no-sew version, just use hot glue or liquid stitch for this part.) 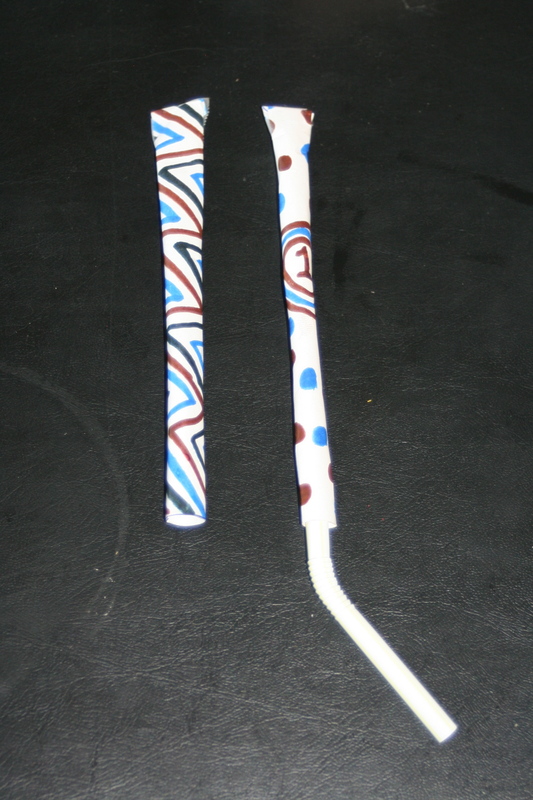 Mark (in pencil or chalk) the top block and 6 streamers about 11″ long and 2″ wide. Sorry for the wrinkly pictures! 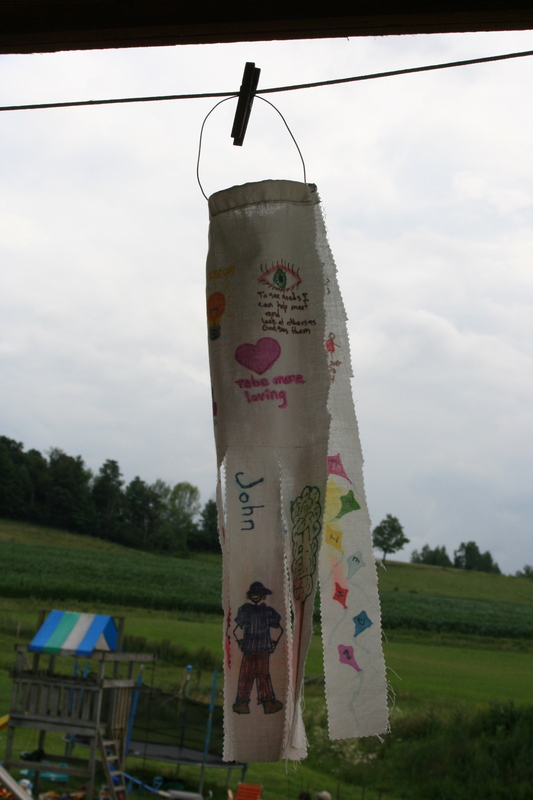 The kids used permanent marker to draw/write their prayer(s) on the windsock. I encouraged them to think of things they were thankful for or things they wanted to ask God about or talk to God about. I just reminded them that anything drawn on the windsock tails would be cut apart if they didn’t stay in the lines there. 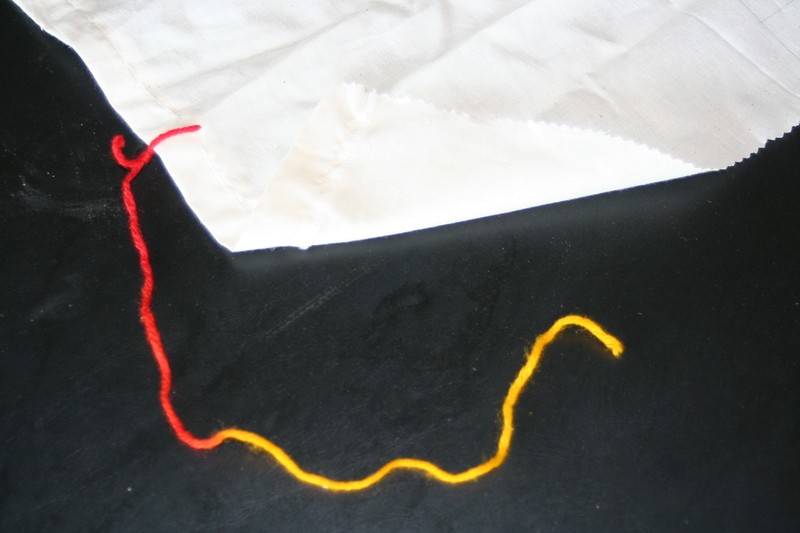 After coloring, cut up the tail lines (but don’t cut them off, of course…). These tails have been waving in the breeze for a little while now, and are holding up pretty well. 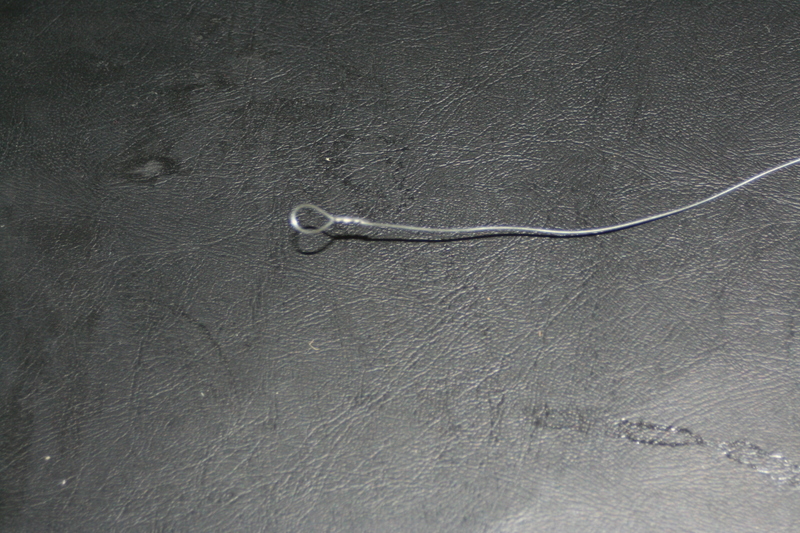 Then a bit of hot glue (I did this part for them). I wrapped around a pringles can for a form to work on. 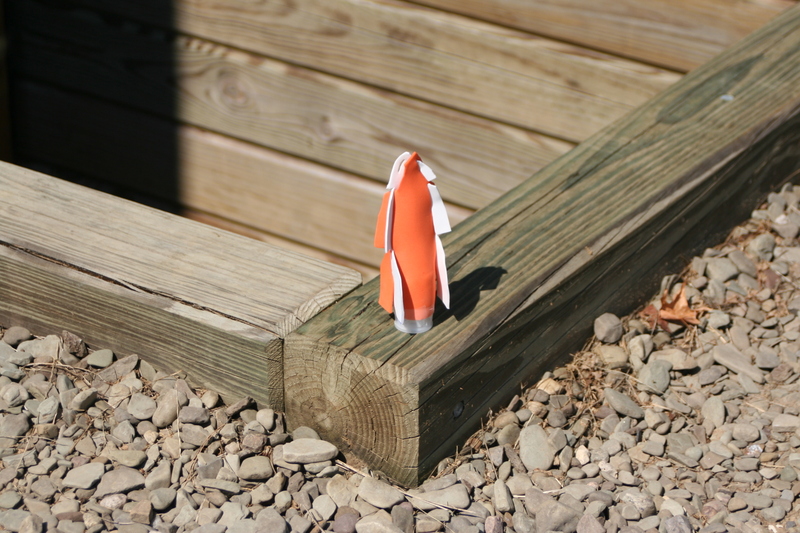 Just overlap the two edges and glue down the main body portion of the windsock. 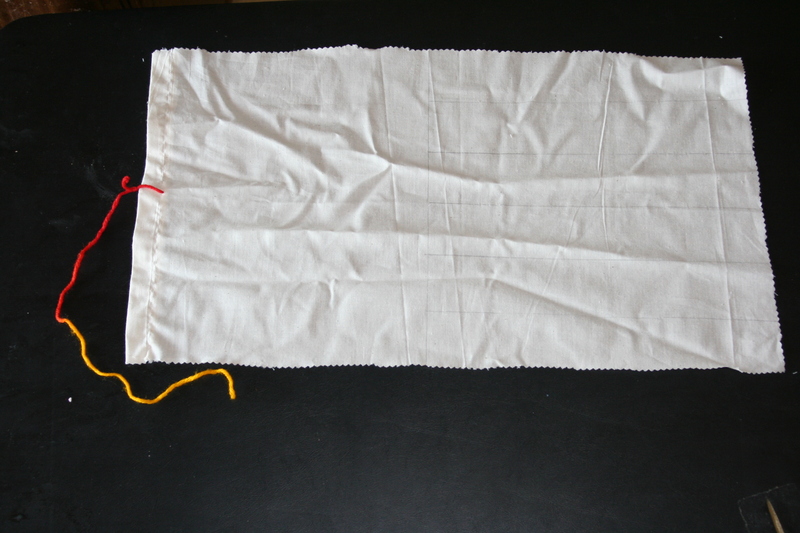 I pre-cut and twisted wire to go through the channel sewed in the top. 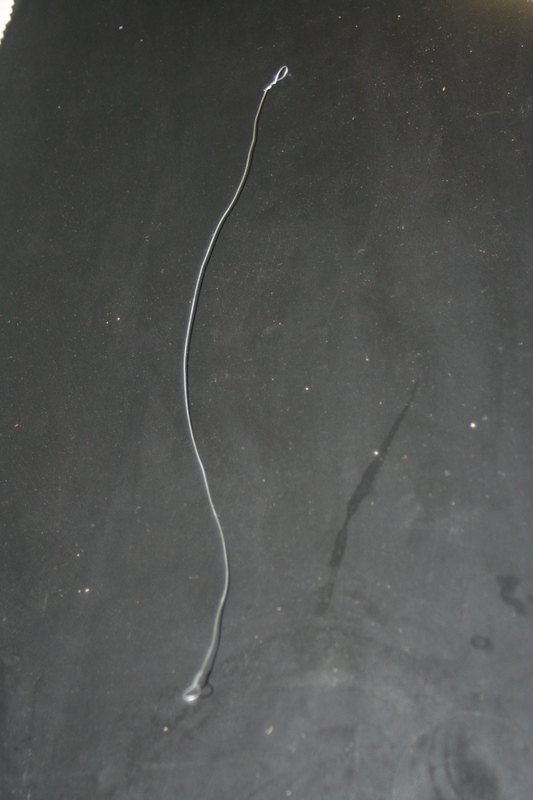 Total length is about 14″ with a small loop twisted into each end, so finished size is just over 12″. Mine is cut from a roll of picture hanging wire. 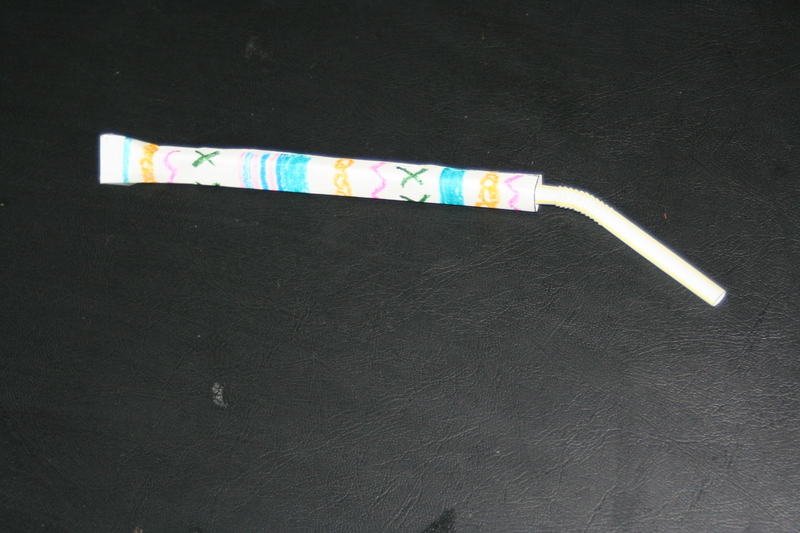 Pipe cleaners might work fine here if they’re long enough- I just didn’t have that on hand when I was making these. Beautiful reminders of prayer, the connection we have with God through prayer, and the ability to pray in different ways. 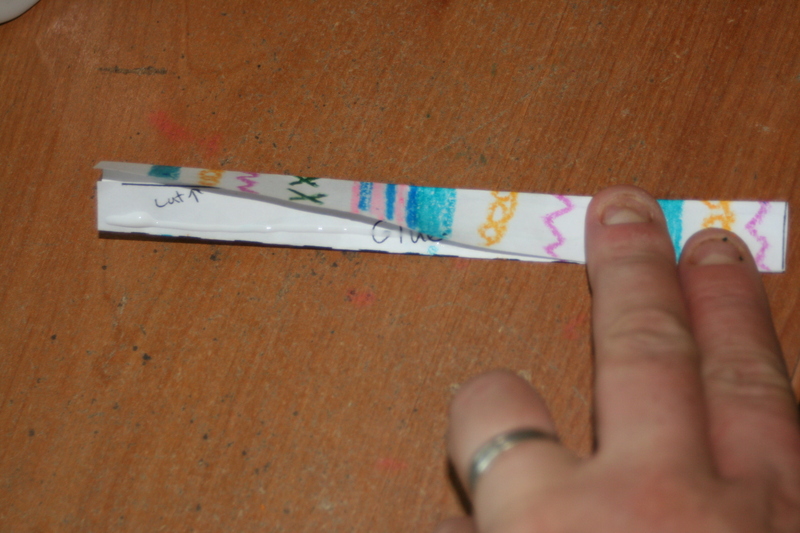 For more VBS/ kids crafts, check my VBS tab. 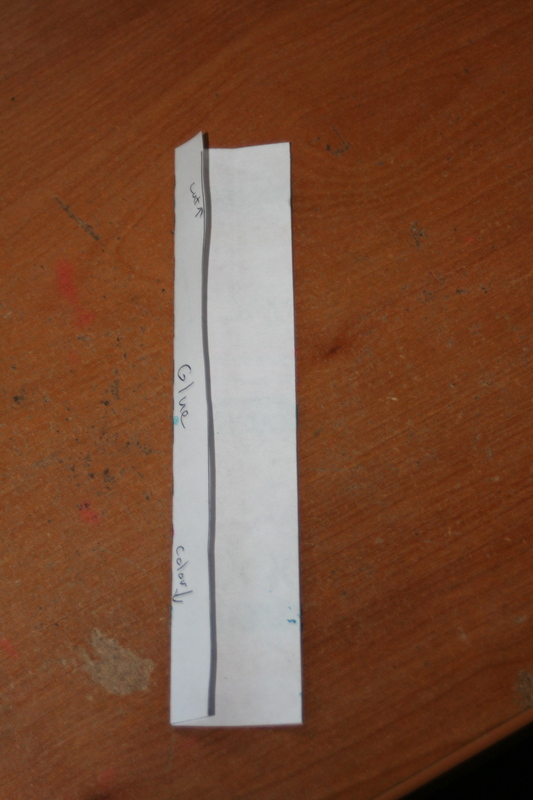 Day 2 was film canister rockets. Yes, another rocket, but these are a different animal. Very fun! The tricky part is coming up with enough canisters, and the right kind. Either plan to pay for them, or start collecting early. Don’t forget to check out your local film processing places to see if they have any or can save any for you or search their recycling bin for them. Walmart, drug stores, camera shops, etc. may have them. It really does matter that the canisters have the top that fits like a plug/cork. The ones that snap around the outside lid will NOT work. 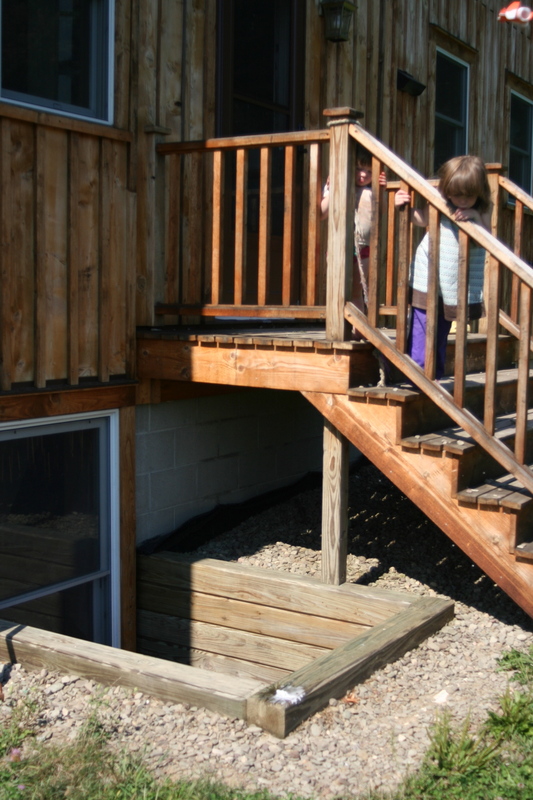 They just flop over after they burst out the side somewhere that the lid snaps on. My first sample I tried card stock and was worried about it falling apart with moisture- my suspicions were quickly confirmed, so I moved on to craft foam. 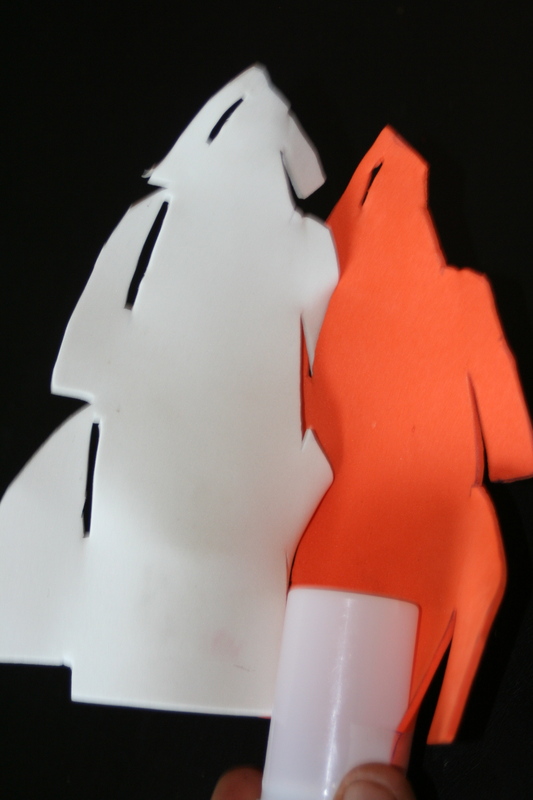 I pre-cut these- foam isn’t that cheap, and there’s other stuff for the kids to do, so they don’t need to cut it. It’s an extensive prep-work craft. Here’s my pattern for the foam on a PDF. 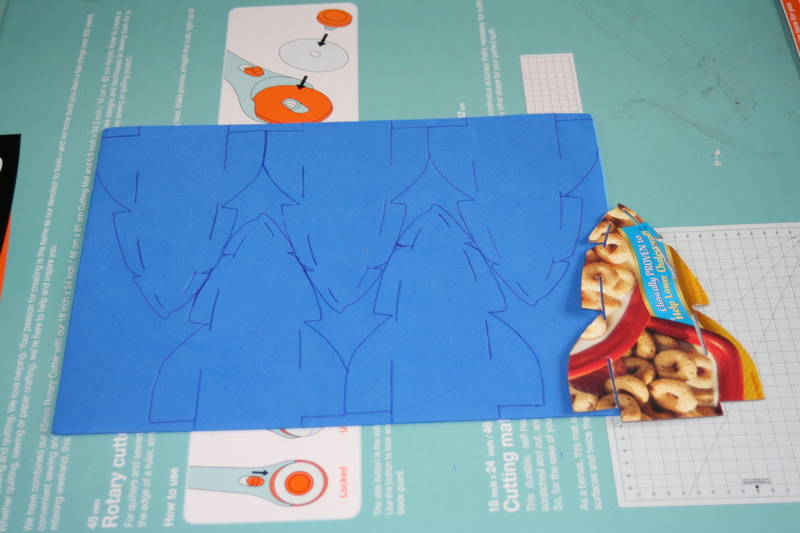 Just cut it out of an old cereal box for your stencil and you’re ready to trace on foam. 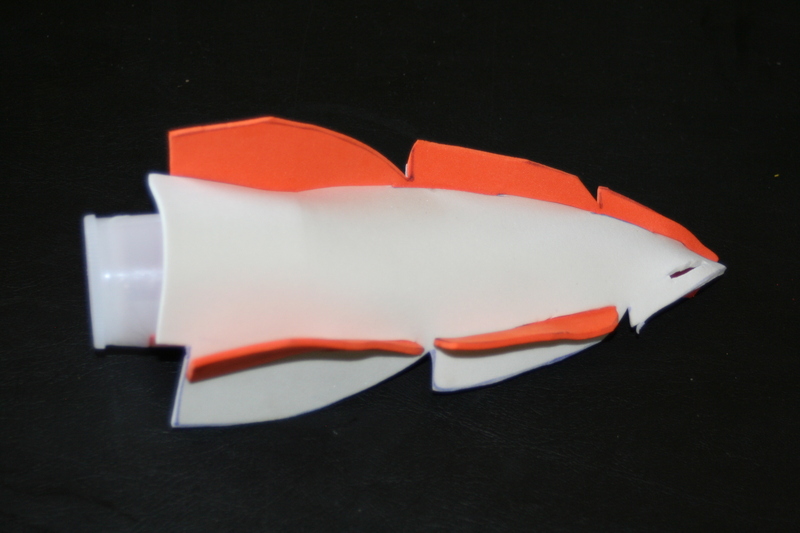 I was able to squeeze 5 on a sheet- you may need to shift the fin slightly off the page to squeeze all 5 on You’ll need 2 pieces per kid, but they’re exactly the same and interlock to form the rocket. It just needs to be attached to the canister. 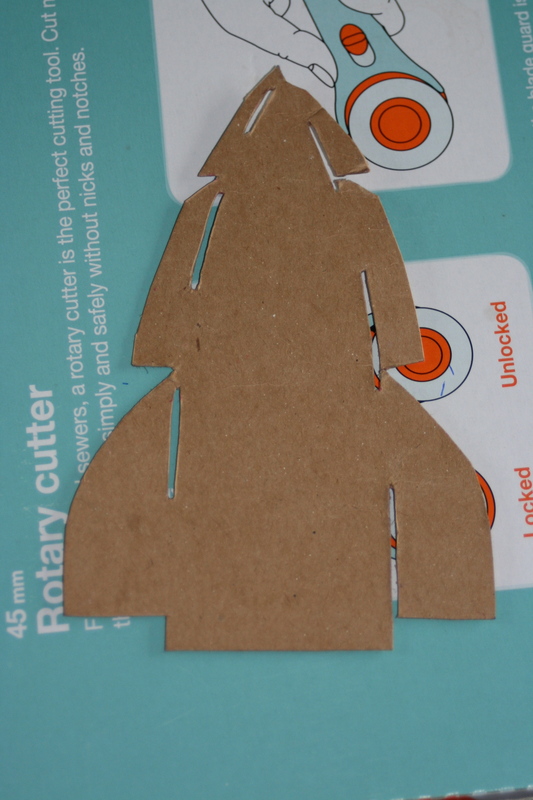 Then interlock the fins and the holes on both sides. 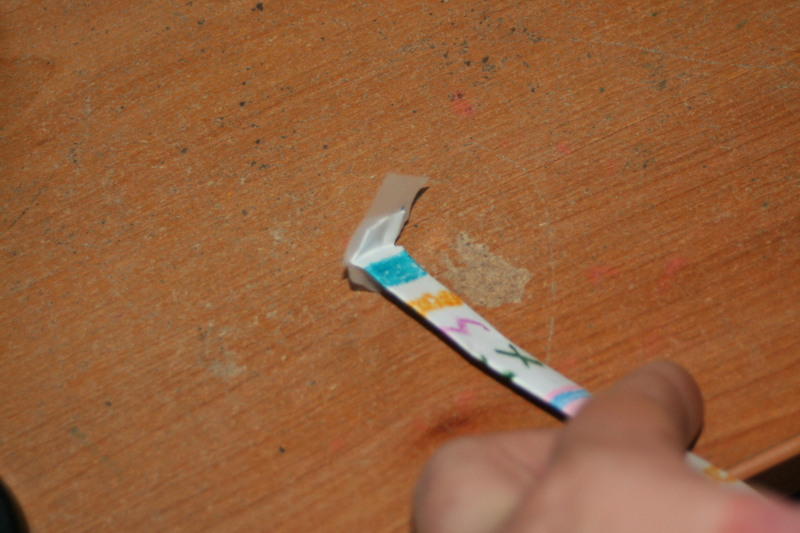 Last task is to tape the other half of the rocket down to the canister. That’s it! Now for the exciting part! Go outside to fly them! 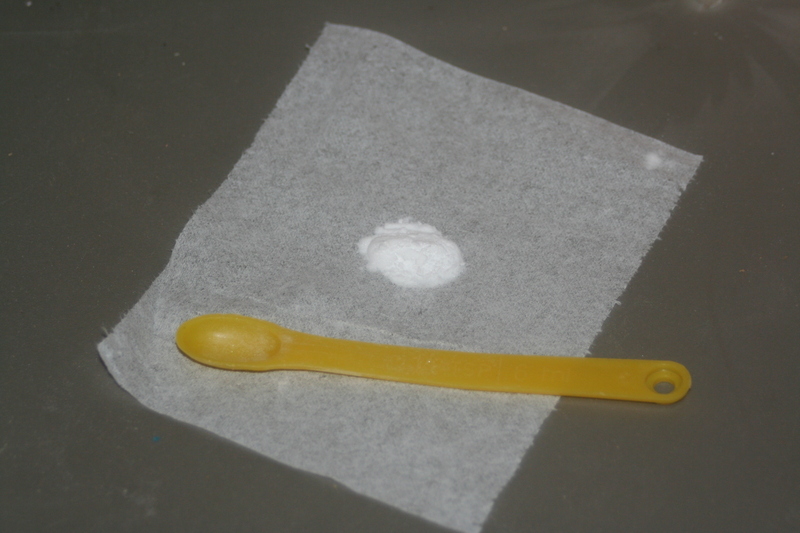 I pre-made baking soda packets, so a pitcher of vinegar allowed us to launch everyone’s rocket once. 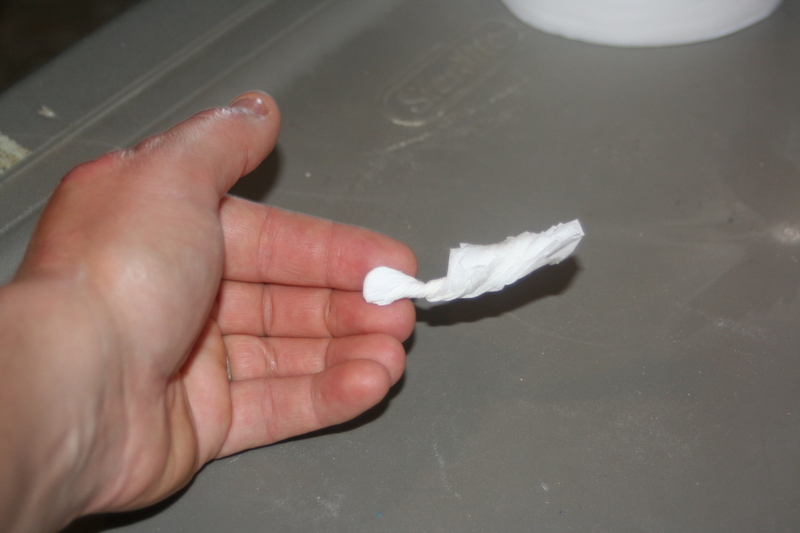 To make the baking soda packets- I used a sheet of TP (any ply will work) with about 1/8 teaspoon of baking soda. Put the soda in the center and twist a tail on it. More baking soda actually made them fly poorly- it needs to be a balance so the “fuel” is all used up. Ditto on the vinegar- too much makes them pop too quickly and not as high. 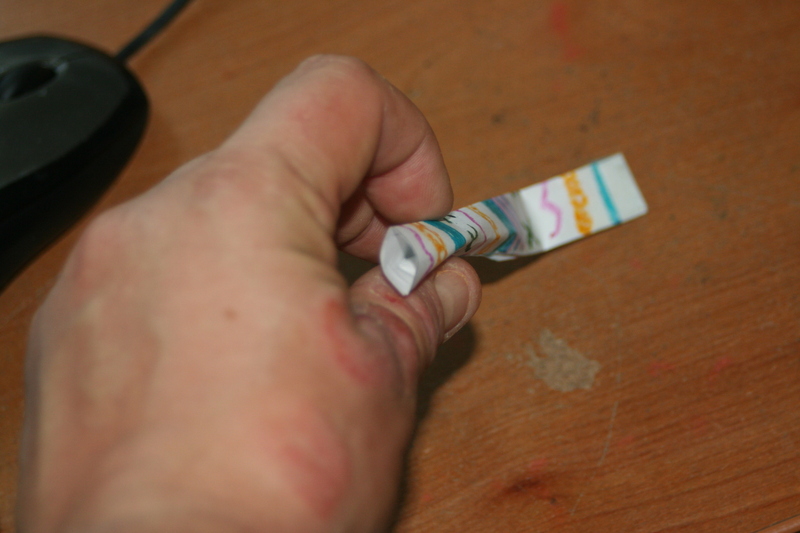 You want space for the pressure to build up in the canister so it will launch higher. 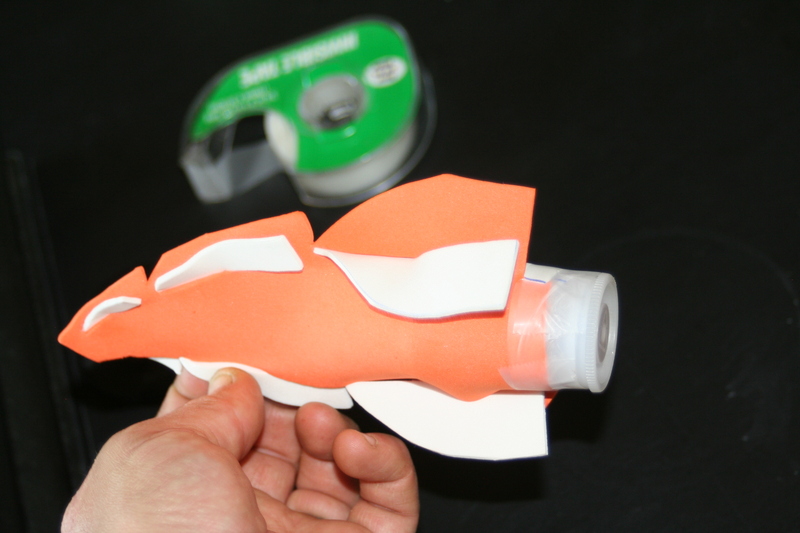 To fly the rockets: fill the canister about 1/2 way with vinegar. 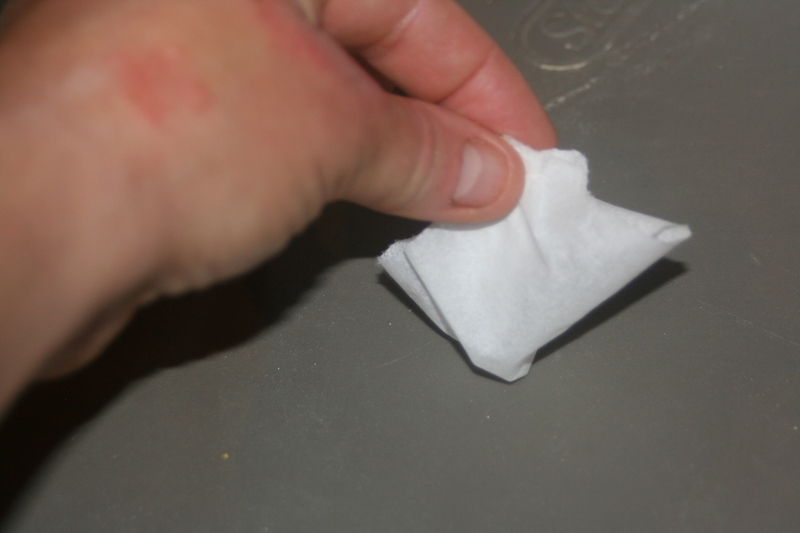 Set the baking soda packet in- tail pointed DOWN into the vinegar. 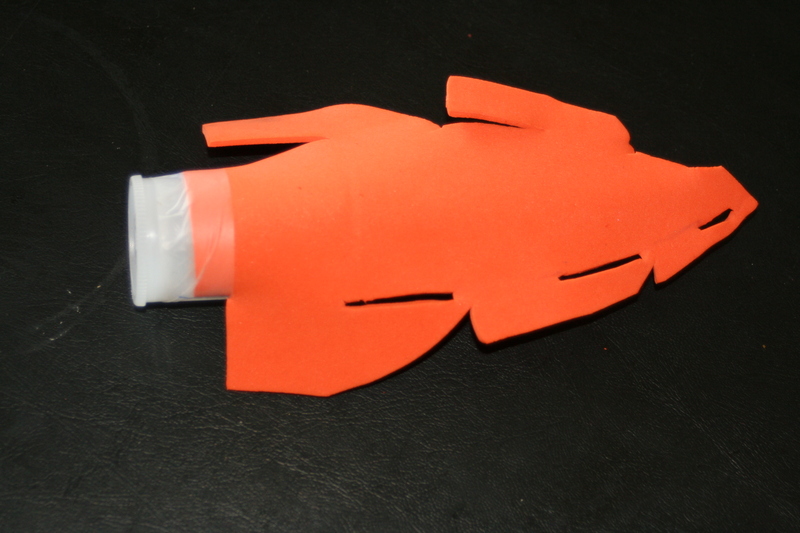 Quickly put the cap on, flip the rocket upside down on a “launch” surface, stand back, and watch. Within 5-10 seconds, the rocket will fly! The rocket below was on the front of the window well. Notice in the very top right corner of the second photo below there’s a rocket. That’s about all the further it went up, but it’s pretty neat. I made up a handout for the kids to take so their parents could help them repeat the fun at home. Here’s the handout in PDF (copy and cut- each kid will only receive a partial sheet of paper). 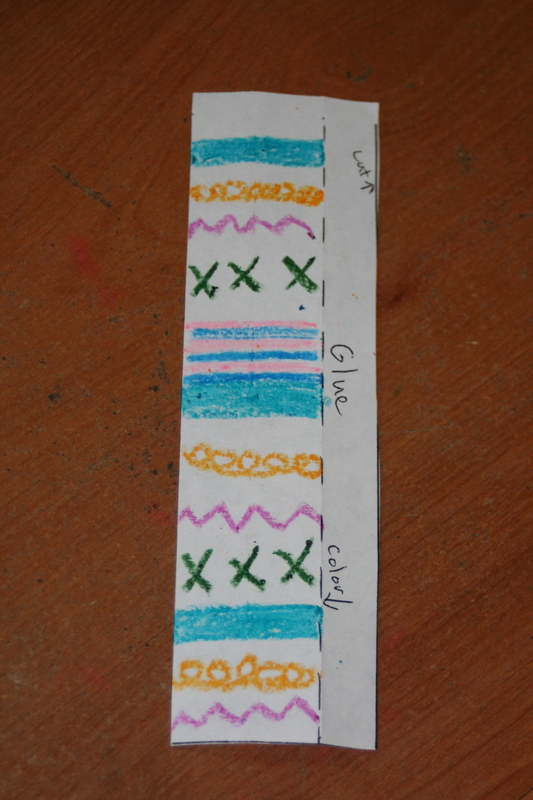 For more VBS craft ideas, check my VBS tab!